Touch Sensor Switch with Adjustable Light: You can keep it glowing with a single touch and adjust it to meet your needs. 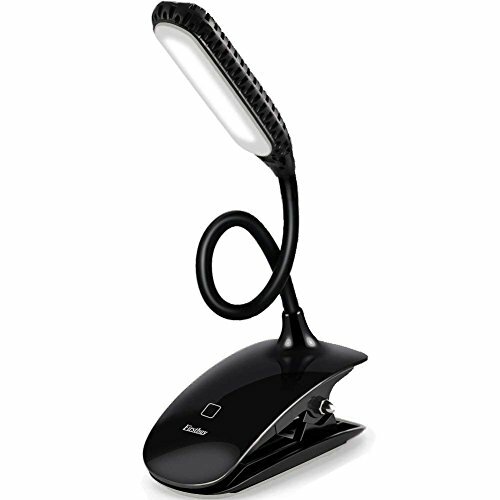 Streamlined design: The led reading lamp has 3 levels of Brightness (Dim, Bright and Strong light). The smart touch sensor helps you get the right flow that protect your eyes. The light looks like Natural. Long Battery Life: Built in high capacity 1000mAh lithium battery. The lamp can work for 10 hours in dim brightness mode, 8 hours in medium light and 4 hours in the brightest light. Good for Home, Office, Camping and other unique lighting needs! 1.Charge the lamp immediately when the light dimmed. 2.Charge the lamp for at least 8 hours before first use. 3.Fully charge the lamp at least once every two months. The product brought from LENPOW can enjoy 12-MONTH warranty & 30-DAY money back guarantee. Any problem please feel free to contact us, we'll try our best to earn your 100% satisfaction! ✅RECHARGEABLE BATTERY WITH USB DESIGN: Constructed with USB Cable, USB charing function makes it more convenient. This LENPOW Book Light is much more convenient to charge when it is out off power. It can be powered by USB charger, plug and play, notebook PC USB, Mobile phone adapter, Car USB and etc.